Just a reminder to you all that this week is budget time in Costa Mesa. 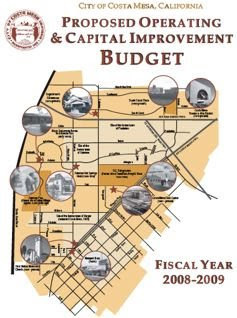 On Tuesday, June 10th, the City Council will receive a presentation on the 2008-2009 budget by the Finance Department Staff in a Study Session at 4:30 in Conference Room 1A. This meeting is open to the public and limited public comments will be permitted. Thursday, at the same location, from 6:00 - 8:00, there will be a budget workshop held for members of the public during which the city staff will present all, or at least most, of the presentation they made Tuesday to the council. I've attended the past several such workshops and found them to be very enlightening. Unfortunately, they are usually very sparsely attended - there were only a couple of us at the most recent two. Typically, no members of the City Council are present at the workshop. The city staff members who participate in this presentation are patient and very informative. They have won awards for many years for their budget presentation - there's a large bookcase in the Finance Department filled to overflowing with plaques and trophies for their budgets from prior years. The several documents they prepare - there's one for just about every possible level of interest, beginning with their excellent Budget-at-a Glance booklet - will answer most questions residents will have. For those inclined to nit-pick the details, there are a couple other publications available providing line item detail for your review. Each of these documents are available for download on the city web site - there's a link to that site over on the right of this page. This is an excellent opportunity for residents of our city to learn about the budget and the overall financial condition of our city. I encourage any of you interested to join me at the workshop on Thursday evening to find out why our city is in such good financial condition - unlike places like the City of Vallejo, which recently filed for bankruptcy protection.